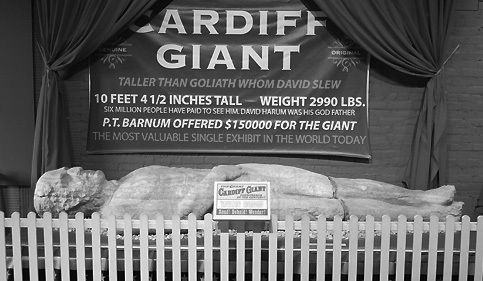 The Cardiff Giant, a ten-foot-long gypsum figure known as “America’s Greatest Hoax,” has been on exhibit since the 1940s at The Farmers’ Museum. The Cardiff Giant exhibit traces the story of this “petrified man,” which was the centerpiece of a moneymaking scheme by a businessman from Binghamton, New York. The Cardiff Giant was created and displayed in the 19th century, and public reaction to it reflected the scientific and religious beliefs of the time. George Hull, a cigar-maker and get-rich-quick artist, came up with the idea to create the Giant during a business trip to Iowa. Hull, an atheist, argued with a revivalist minister about a biblical passage. The phrase “There were giants in the earth in those days” (Genesis 6:4), sparked Hull’s imagination and led to an involved plot that eventually made him a fortune. In 1868, Hull went to Ft. Dodge, Iowa, and ordered a five-ton block of gypsum to create, he explained, a piece of patriotic statuary. The block was delivered to a stonecutter, Edward Burghardt, in Chicago, who, having been sworn to silence, created the Giant. The figure was then secretly shipped to the village of Cardiff, just south of Syracuse, where it was placed in a pit and covered. In 1869, the man on whose farm Hull had hidden the Giant hired two workmen to dig a well. He ordered then to dig it in the spot where the Giant had been buried, and the workmen thus directed soon made their startling discovery. Word of the unearthing of a petrified man spread quickly around the countryside. People came from miles around to see the Giant, which was identified as an example of an ancient race mentioned in Genesis by some believers. “Found” in the heart of New York’s Burnt Over District, the Giant benefited from the religious fervor sweeping the area. Scientific experts offered another theory on the Giant’s origin. Dr. John F. Boynton, scientific lecturer, declared that the Giant was a statue created by a Jesuit priest during the early 17th century to awe local Indian tribes. State Geologist James Hall was also convinced that the Giant was an ancient statue. A third group said it was a hoax, but this in no way diminished its popularity. In 1947, the Giant was sold to The Farmers’ Museum in Cooperstown. It is now on display inside the main barn of the museum.